In the 3rd inning of Tuesday night's game with the Washington Nationals, John Smoltz recorded career strikeout number 3,000. He becomes just the 16th player in MLB history to accomplish this milestone. The last pitcher to do so was Pedro Martinez in September 0f 2007. Nolan Ryan is chairman of this elite group with an amazing 5,714 strikeouts. Smoltz's 1st strikeout victim was Darryl Strawberry of the Mets in July of 1988. John has 210 wins and 154 saves to go along with his 3000+ strikeouts. 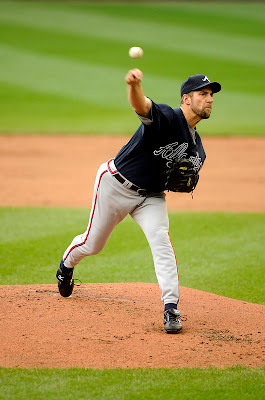 Because of those years working as a closer out of the Braves bullpen, the 40 year old hurler won't make it to 300 wins. Nevertheless, the Hall of Fame numbers have already been achieved. I've always thought that when you watch the movement of his pitches from the centerfield cameras, you're really watching a master at his craft. The lifetime Brave usually shows tremendous velocity, great location, and good movement. He's always been a class act off the field as well, having won both the Roberto Clemente and Lou Gehrig awards. The awards are based primarily on a player's character. Hats off to John Smoltz! Keep sittin' em down and we'll keep countin'. For years to come!